Are Your Trees At Risk? Your trees can suffer a lot of damage and can also do serious damage to your home or vehicle. They can also knock out power. 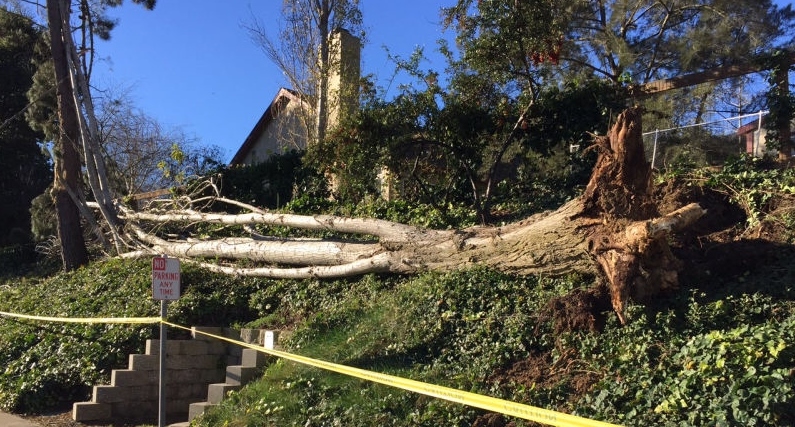 Drought stressed trees are more vulnerable to the high winds and heavy rain of an El Niño winter. Limbs can break off and go flying. The bigger the tree, the bigger the problem. Call Gardeners’ Guild. We partner with a few of the best arborists and have access to state of the art services. We will arrange a thorough inspection of your trees. They will be able to detect if a tree is structurally sound. You can’t tell by sight only if your tree is structurally sound. Gardeners’ Guild can offer you state of the art tree care and we can coordinate the entire process from start to finish. Decay – usually occurs in the lower part of the trunk near root zone. https://www.gardenersguild.com/wp-content/uploads/gardenersguild-logo.jpg 0 0 sharris2011 https://www.gardenersguild.com/wp-content/uploads/gardenersguild-logo.jpg sharris20112015-11-05 21:20:442015-11-05 21:20:44Are Your Trees At Risk?